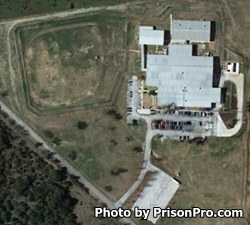 San Saba Transfer Facility, sometimes referred to as the San Saba Unit, is located in San Saba Texas and houses a maximum of 606 inmates. At one time the San Saba Unit was an all male facility, but today it houses only adult female inmates with a current population of around 575. The San Saba Transfer Facility is comprised of thirteen buildings with 32 housing areas, twenty four of which are open bay dormitories. Most offenders are incarcerated here for no more then two years, and have a security classification of G1 to G2 minimum custody. San Saba Transfer Facility provides inmates with a law library, chapel, gym, infirmary, recreation yard, barber shop, and laundry facility. Some inmates are eligible for work details which include working in facility maintenance, laundry, and in unit's garden. Educational programs are provided through co-operation with the Central Texas College Academy. Additionally, some inmates may provide a supervised labor service to local city government agencies. The San Saba Transfer Facility holds visitation hours on Saturdays and Sundays from 8am to 5pm. Inmates are permitted a single visit per weekend. Visits are limited to two hours in duration unless the visitor is traveling over 300 miles and has gained advanced approval from the Warden's office for a special visit.